Although there are various French manicure designs and nail arts in the web today for you to try out, basic French tips can never go wrong. It’s the most simple, classic and timeless nail manicure you could do for yourself. That’s the reason why bridals opt for light pink nails or French nails for their big day too! 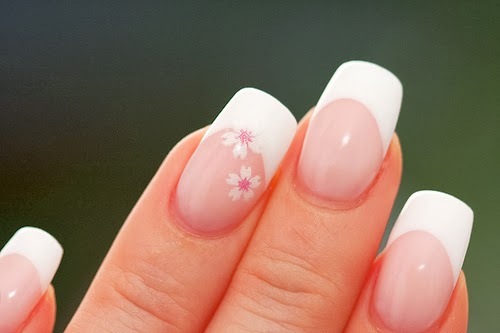 This post is going to teach you on how to do a basic French tip manicure! It's essential to prepare your hands and nails before applying nail polish. First, exfoliate your hands by massaging them using a small amount of body scrub. Rinse with water and dry thoroughly. One of the main causes of chapped hands is not drying them properly after washing. File your nails. If they are brittle or tend to split, keep them flat across the top with smooth, rounded edges. When filing, move in one direction, from outer corner to centre-sawing movements can damage the nail plate. Choose a nail file with a fine surface that glides over the nail. Coat hands in a layer of sweet almond oil, to nourish and soften, then wrap in a warm towel and relax for 15 minutes. Unwrap, and gently push back cuticles using a rubber hoof stick (available from most chemists). Never use cuticle clippers, as they can nick the skin. Rinse hands with warm water and dry thoroughly to remove any oil residue. Apply one coat of base coat over your entire nail and allow a couple of minutes to dry. This will help strengthen the nail. Some products also level fine ridges and imperfections, leaving a smooth surface to apply polish. There's a wide range of base coats to choose from. For a square look, paint a straight line across the tips; for a rounded appearance, follow the curve of the nail; and to get a pointed style, paint in from each side to the centre. Some manicure kits include sticky strips to use as a guide. When applying, lay your hand on a flat surface and keep the ball of your painting hand steady and keep the ball of your painting hand steady by resting it on the same surface. Leave to dry. Finally, apply a coat of translucent shell-pink nail polish over the entire nail to seal the whitened tip and complete the look. Allow 10 minutes for it to dry. For extra shine and protection, apply a clear, glossy top coat.